Disney's Frozen is taking the world by storm. All your favorite characters, Elsa, Anna, Kristoff, and Olaf, are big and bold right at the entrance of the licensed Frozen theme bouncer. America's #1 party theme is now available from your trusted party company. Lotza Party theme parties are a great way for busy parents on the go to purchase an entire birthday package. Lotza Party has included all your party needs so you can relax and enjoy your childs special day. Our cast members will drop off your theme party the morning of your event and pick up your party rental immediatly after your party ends. Lotza Party offers great party upgrades like hosts and servers or sweet tasting concession rentals. If you are looking to provide your son or daughter with the most popular inflatable bounce house in the world than we have your ride. Disney's frozen bounce house is a medium size bounce house that is great for yards of all sizes. You can bring Anna, Elsa, Sven, Olaf and pals into your backyard with this amazing inflatable jumper. 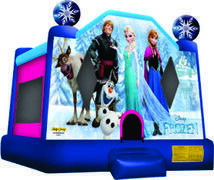 Our Frozen inflatable bounce house is a great budget alternative to provide great entertainment for you childs Frozen Theme party. Lotza Party also offers Meet and Greets with your favorite characters.